This page Clamores horrendos is part of the medium specificity series. Clamores simul horrendos ad sidera tollit (he lifted to heaven horrendous cries) is a phrase from Virgil's account of the death of Laocoön in the Aeneid. 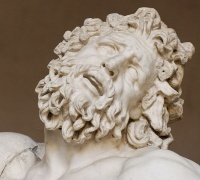 The horrendous cries are usually identified as bellowing and are the object of speculation in Johann Joachim Winckelmann's "Thoughts on the Imitation of Greek Works in Painting and Sculpture," Gotthold Ephraim Lessing's "Laocoon: An Essay on the Limits of Painting and Poetry" and Charles Bell's Essays on the Anatomy of Expression in Painting. and has shaken the ill-aimed axe from its neck. Unless indicated otherwise, the text in this article is either based on Wikipedia article "Clamores horrendos" or another language Wikipedia page thereof used under the terms of the GNU Free Documentation License; or on original research by Jahsonic and friends. See Art and Popular Culture's copyright notice. This page was last modified 13:48, 6 May 2016.